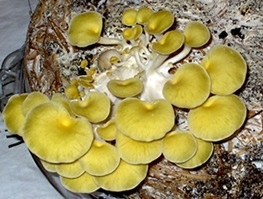 The cultivation of gourmet and medicinal mushrooms is becoming increasingly popular, both as a hobby and for profit. The NAMA Cultivation Committee was formed to promote this fascinating activity and to provide information to cultivators or aspiring cultivators. Pages in this section provide an overview of mushroom cultivation and guidelines for how to start growing your own mushrooms at home. You will also find information about the potential of mushroom cultivation to provide food security and alleviate poverty in developing nations. In addition you will find an extensive set of links to information and resources regarding mushroom cultivation. We encourage you to join the NAMA internet user group devoted to mushroom cultivation, The NAMA Mushroom Culitvation Discussion Group, for use by NAMA members and members of affiliated mycological societies. The group serves as a forum for mushroom cultivators or those who have an interest in mushroom cultivation. It is also intended as a vehicle for posting articles, for asking questions, and sharing helpful hints, new techniques or any other information that would be useful for mushroom cultivators. If you would like to join the group, please click on the button below.